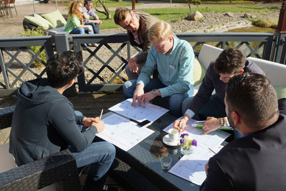 The Zentrum für Entrepreneurship (Centre for Entrepreneurship) of PFH has been offering this three-day intensive seminar for young business starters on a regular basis since 2010. Starter teams are invited to compete with innovative ideas and concepts that offer the promise of sustained success. In addition to project work in ideas workshops, participants work on specialist and methodological content relating to entrepreneurship, together with high-calibre consultants from business and academia. Challenging soft skill units complement the compact learning programme. Following the intensive day programme, the evening fireside chats offer participants an opportunity to discuss with interesting entrepreneurs and business starters about their experiences.